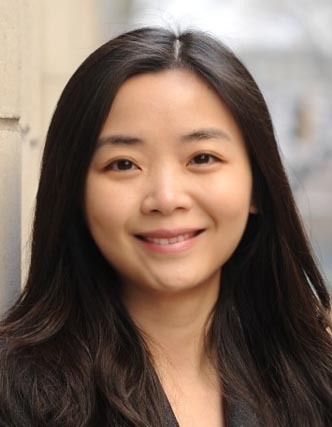 Critical differences in board tenures and characteristics between family and nonfamily firms affect firm value and performance, argue Professors Huimin Li, Harley Ryan, Lingling Wang and Baozhong Yang. Their study extends our understanding of the mechanisms that govern family firms and has important implications for founding families, investors and policy makers. As an integral component of governance mechanisms in publicly held firms, the board of directors seeks to protect the interests of dispersed shareholders who finance the firm’s operations but delegate daily control to professional managers. However, in a large proportion of publicly traded firms, founding families maintain concentrated ownership and are active in the management of the firm. These features mitigate the need to protect the interests of diffuse shareholders from the actions of delegated management, but create new incentive conflicts between family owners, who can receive unique private benefits of control, and nonfamily shareholders. In Li et al. (2013) and ongoing research, we examine boards of directors in family and nonfamily firms and address the following questions: 1) How do boards of directors in family firms differ from those in nonfamily firms? and 2) How are board characteristics associated with firm performance in family and nonfamily firms? Our study is motivated by a divergence between the hypothetical model of dispersed shareholders and the separation of ownership from control, and the empirical reality that a significant proportion of publicly traded firms are owned and controlled by founding families. Indeed, empirical evidence suggests that family firms comprise over 47% of the 2,000 largest firms in the U.S. (Anderson, Duru and Reeb, 2009), about 44% of the public companies in Western Europe (Faccio and Lang, 2002), and over two-thirds of the firms in nine East Asian countries (Claessens, Djankov and Lang, 2000). But just what is a family firm? In concept, a family firm is a firm in which the founding family maintains a substantial ownership and personal interest. However, empirical researchers must classify firms based on observable attributes. We follow Anderson and Reeb (2003) and Villalonga and Amit (2006) and broadly define a firm as a family firm if one or more members of the founding family: (i) are named executives in the firm, (ii) sit on the board of directors, or (iii) hold in the aggregate five percent or more of the firm’s outstanding common stock. Although this definition is broad enough to ensure the inclusion of family firms, it possibly classifies some entrepreneurial firms with founder presence as family firms. Thus, we also examine firms that meet this definition but no longer have founder involvement. even for the directors who meet the stock exchange requirements for “independence.” For example, we examine the average independent director tenure on the board, the incidence of having a majority of long-tenured independent directors (directors who have served 12 years or longer), and the tenures of the chairs of key monitoring committees. The average independent director tenure is 7.7 years in family firms compared to 6.8 years in nonfamily firms. Seventeen percent of the family firms in our sample have a majority of independent directors with tenures that exceed 12 years, compared to nine percent of the nonfamily firms. In addition, the chairs of all the primary monitoring committees have longer tenures in family firms. For instance, the chair of the compensation committee has an average tenure of 10.5 years in family firms, compared to nine years in nonfamily firms. These differences persist even after controlling for a variety of firm characteristics, CEO characteristics, year effects, and industry effects. 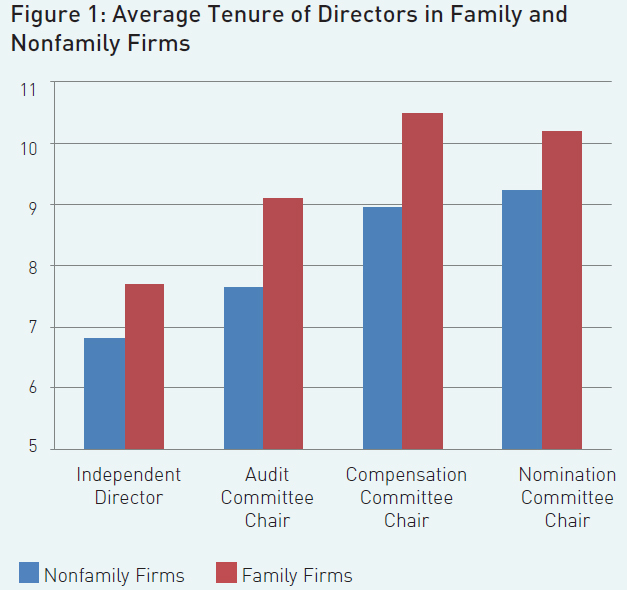 Figure 1 illustrates the differences in director tenures on the boards of family and nonfamily firms. The differences in the tenures of the directors of family and nonfamily firms are important since director tenure provides an observable characteristic that offers insights into directors’ abilities and their incentives. On the one hand, longer tenures allow directors to accumulate greater firm-specific knowledge and enhance their commitment to the organisation (Buchanan, 1974). Such knowledge and commitment should enable directors to be better monitors and better advisors, thereby better serving the interests of shareholders. In addition, an efficient market for director talent suggests that the most capable directors should accumulate longer tenures. On the other hand, longer director tenures may erode board independence as directors become friendly with management and lose their independence (Vafeas, 2003). In addition, scholars argue that the tenure of top executives increases their commitment to the status quo (Hambrick, Geletkanycz and Fredrickson, 1993). It is reasonable to expect that long director tenure may have a similar effect, thereby creating a board that is slow to respond to internal inefficiencies or changes in the competitive environment. Conflicts between family owners and nonfamily shareholders arise because members of the founding family receive unique private benefits (for instance, preserving a legacy of family control at the expense of value maximisation) that are not shared by nonfamily shareholders. Thus, founding families have an incentive to choose directors whose allegiance is to the family, which creates a significant constraint to choosing directors with the incentives and skills to maximise firm value. By virtue of historical control and concentrated ownership, families retain significant influence over who sits on the board. Even if family ownership diminishes over time, directors tend to be routinely reelected (Cai, Garner and Walkling, 2009), which perpetuates the family’s initial influence over the board. Consistent with this premise, Villalonga and Amit (2009) find that approximately 60% of founding families have board representation in excess of their voting rights even when they do not have explicit enhanced control rights such as dual-class stock or voting agreement. These arguments and the unambiguous differences between director tenure in family and nonfamily firms raise an intriguing question: Does family representation on the board extend to long-serving directors who have an allegiance to the founding family? Certainly, founding families have incentives to put family-friendly directors on the board and use family influence to ensure that these directors amass significant tenure. Furthermore, the bonds between the families and these friendly directors are likely to strengthen over time. It follows that a long-tenured board in a family firm is likely to represent a more family-friendly board and lack independence. In nonfamily firms, empirical evidence suggests that directors with shorter tenures are likely to be less independent. For instance, studies find that powerful CEOs influence the director nomination process (Shivdasani and Yermack, 1999; Fracassi and Tate, 2012), which results in co-opted directors with shorter tenures than the CEO (Coles, Daniel and Naveen, 2013). Since these directors are indebted to the CEO fo their positions, they fail to retain an independent perspective with respect to monitoring the CEO on behalf of shareholders. Thus, we posit that the relation between firm value and director tenure is different in family and nonfamily firms. In nonfamily firms, powerful CEOs can influence the director appointment process and co-opt new directors. In family firms, however, family power will supersede CEO influence and result in long-tenured board coopted by the family. Based on these arguments, we expect a positive relation between firm value and board tenure in nonfamily firms, but a negative relation between firm value and board tenure in family firms. To test our hypotheses about the relation between firm value and tenure in family and nonfamily firms, we examine the influence of director tenure on firm value conditional on the ownership structure of the firm. Our hypothesis is that greater firm-specific human capital allows directors to be better monitors and advisors. We find that firm value is significantly and positively related to all our measures of long-tenured boards in nonfamily firms. In contrast, we find a negative but statistically insignificant relation between firm value and the tenure measures in family firms. Thus, we segregate our family firms into those firms with a founder CEO and those firms with a nonfounder CEO. In a baseline model that does not consider director tenure, we first verify the finding in the literature that family firms add value only when the founder is the CEO. However, we find that the relation between value and family control when the CEO is not the founder critically depends on the tenure of the directors. Supporting our hypothesis that longer director tenure leads to ineffective boards in family firms, we find a significant negative relation between firm value and nonfounder CEOs when director tenure is longer, but a significant positive relation between firm value and nonfounder CEOs for shorter director tenure. We also examine the influence of director tenure in family and nonfamily firms on the valuation impact of mergers and acquisitions. Mergers and acquisitions are significant transactions that impact firm value. These transactions also represent a major decision where board advice is particularly important. Our results for the influence of director tenure on the announcement returns to mergers and acquisitions complement those for total firm value. In nonfamily firms, announcement returns are significantly positively related to our measures of director tenure. Long-tenured directors, who are perhaps unwilling to intervene or are wed to the status quo, contribute to the valuation loss in subsequent generations. Indeed, when board tenure is reasonably shorter, family firms with nonfounder CEOs continue to be associated with higher value. Our paper extends our understanding of the mechanisms used to govern family firms and how these mechanisms interact with family control to influence firm value. Villalonga and Amit (2006) find that value creation in a family firm declines after the founder ceases to be the CEO. We find that longtenured directors, who are perhaps unwilling to intervene or are wedded to the status quo, contribute to the valuation loss in subsequent generations. Indeed, when board tenure is reasonably shorter, family firms with nonfounder CEOs continue to be associated with higher value. A major implication of our research for understanding the governance of family firms is that many founding families tend to place a greater weight on allegiance to the family when choosing directors than on their ability to monitor and advise. In contrast, family firms that bring in new generations of directors after their founders leave the CEO position create the most value. Thus, founding families that desire to preserve value creation beyond the first generation may wish to alter the composition of their boards prior to the exit of the founder. Likewise, nonfamily investors in family firms should be cognisant of the interaction between director tenure and family control. Recent research focusses on new dimensions of director characteristics that extend our understanding of board qualifications beyond the mere size and composition of the board and the compliance of directors with exchange listing requirements for independence. We add to this strand of the literature along two dimensions. First, our evidence suggests that director tenure is an observable characteristic that reveals additional information about the capabilities and independence of directors. Second, we show that the influence of director tenure critically depends on the ownership structure of the firm. In nonfamily firms, the effect of long tenure for directors appears to be primarily positive. In family firms, however, the influence of directors with longer tenures appears to be primarily negative. Since family firms represent nearly one-half of the publicly traded firms in the United States, our results suggest that the interpretation of empirical evidence is complicated by the presence of family ownership and control. Failing to consider the ownership structure of the firm could lead to incomplete or even misleading interpretations. Finally, our study has implications for policy makers and corporate governance activists. Regulators should consider director tenure in the context of independence requirements in corporate governance regulations. For example, the Hong Kong Stock Exchange has recently added rules that require explanations about a long-tenured director’s independence from the firm. Such regulations should also take into account the differential roles of director tenures in family and nonfamily firms. Likewise, governance reformers should account for the ownership structure of the firm when calling for changes to the status quo. Anderson, R C, and D M Reeb (2003). “Founding Family Ownership and Firm Performance: Evidence from the S&P 500”, Journal of Finance, 58: 1301-29. Anderson, R C, A Duru, and D M Reeb (2009). “Founders, Heirs, and Corporate Opacity in the United States”, Journal of Financial Economics, 92: 205-222. Beaulieu, N, and A Zimmerman (2005). “Saving Disney”, Harvard Business School Case 9-905-014 (Boston: Harvard Business School Publishing). Buchanan, B (1974). “Building Organizational Commitment: The Socialization of Managers in Work Organizations”, Administrative Science Quarterly, 19: 533-546. Cai, J, J Garner, and R Walkling (2009). “Electing Directors”, Journal of Finance, 64: 2389-2421. Claessens, S, S Djankov, and L H P Lang (2000). “Separation of Ownership from Control of East Asian Firms”, Journal of Financial Economics, 58: 81–112. Coles, J, N Daniel, and L Naveen (2013). “Co-opted Boards,” Working Paper, Arizona State University, Drexel University, and Temple University. Faccio, M, and L H P Lang (2002). “The Ultimate Ownership of Western European Corporations”, Journal of Financial Economics, 65: 365–395. Fracassi, C, and G Tate (2012). “External Networking and Internal Firm Governance”, Journal of Finance, 67: 153-194. Hambrick, D, M Geletkanycz, and J Fredrickson (1993). “Top Executive Commitment to the Status Quo: Some Tests of its Determinants”, Strategic Management Journal, 14: 401-418. Li, H, H Ryan, L Wang, and B Yang (2013). “Family Firms and Boards of Directors: Evidence from Board Tenure”, Working Paper, Tulane University and Georgia State University. Shivdasani, A, and D Yermack (1999). “CEO Involvement in the Selection of New Board Members: An Empirical Analysis”, Journal of Finance, 54, 1829-1853. Vafeas, N (2003). “Length of Board Tenure and Outside Director Independence”, Journal of Business Finance and Accounting, 30: 1043-1064. Villalonga, B, and R Amit (2006). “How Do Family Ownership, Control, and Management Affect Firm Value?” Journal of Financial Economics, 80: 385-417. Villalonga, B, and R Amit (2009). “How Are U.S. Family Firms Controlled? Review of Financial Studies, 22: 3047-3091. 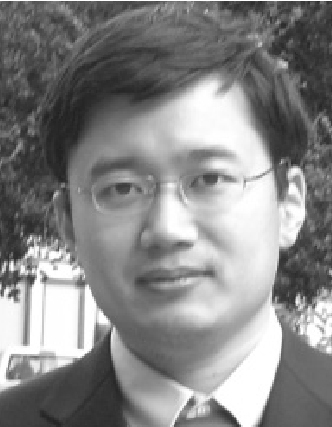 Assistant Professor of Finance, Peter T. Paul College of Business and Economics, University of New Hampshire, Durham. 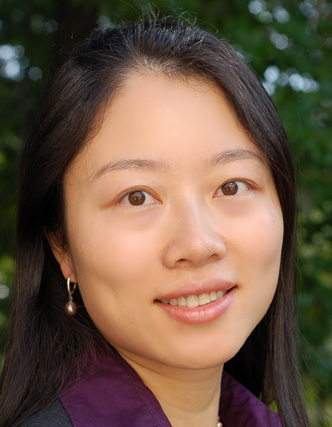 Assistant Professor of Finance, School of Business, University of Connecticut. 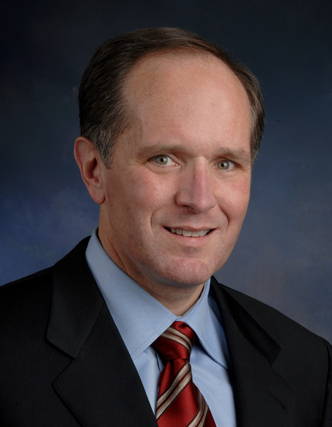 Associate Professor of Finance, Robinson College of Business, Georgia State University.